A daguerreotype is an early type of photograph that was first discovered and patented in France in 1839 by Louis-Jacques-Mandé Daguerre. The process for producing a daguerreotype began with a direct-positive image produced on a copper plate prepared with a layer of photo-sensitive silver halide. Iodine vapor exposure made the mirror-like surface light-sensitive. Placing the plate in a camera and exposing it to a lighted scene formed a latent image. The image was developed by exposing it to heated mercury. Condensation of the mercury on the highlights of the image resulted in an amalgam. Use of a developing box allowed the photographer to stop development when the image was satisfactory. A fixer was used to dissolve any unexposed halides and create the final, fragile image. Daguerreotypes had to be covered in glass to prevent damage to the image including actually rubbing the image off. A brass mat was often placed over the picture to create a space between the image and the glass. A good seal was also necessary to protect the image from oxidation. These enclosures were sometimes vacuum sealed and the air replaced with nitrogen. A brass binding, known as a preserver, was often used to hold the brass mat, daguerreotype and glass cover altogether. These were in general use in the 1850s. 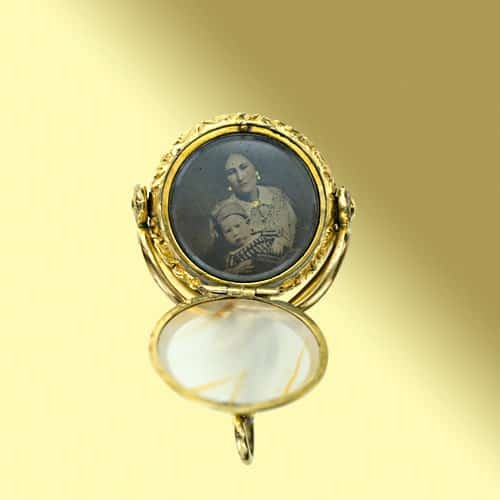 Until the invention of the daguerreotype, hair jewelry, cameos and portrait miniatures were the main forms of memento jewelry. Daguerreotypes quickly eliminated the demand for portrait miniatures and for the miniaturists themselves who, for a short time before disappearing into obscurity, used their skill to colorize daguerreotypes. Jewelers began to produce ready-made empty brooches just waiting for a customer provided daguerreotype of a loved one to complete the piece. Hair mementos continued to be popular and were often paired with daguerreotypes to create a complete remembrance of a loved one. Daguerreotypes were unique images, but the original could be re-daguerreotyped and shared with loved ones. Additionally, lithographic and engraved copies could be made. In this way, the pictures could be reproduced in books and periodicals changing the publishing business dramatically and creating a record for posterity.